Moving back in with your parents to work from home means that there are always domestic projects they can find for you, the perceived new help. Today I had to change the lawnmower blade and cut the grass. 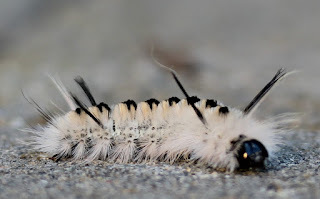 I had just removed the blade from our electric mower and was walking back into the basement with it when a white and black fuzzy furry caterpillar started wriggling across the path in front of me - right by my basement door! It seemed on a mission - it was moving very quickly for a caterpillar. Fascinated, I dropped to my knees and coaxed it to crawl on the mower blade I was carrying (so I wouldn't lose sight of it - it was moving ever so fast for a caterpillar). I then ran into the house to find my camera, cautiously watching the caterpillar to avoid dropping it. (I also did not want to touch it - the setae of caterpillars, marine worms, and other "furry" invertebrates tend to break off in skin and itch, like fiberglass.) This was a very interesting situation for my mother, who was entertaining a house guest. I am curious to know what they must have talked about when I asked her to hold the lawnmower blade and watch the caterpillar while I ran upstairs for my camera! With camera in hand, I returned the caterpillar to where I found it on the ground outside my basement door. I then flopped down on my stomach and started shooting. I purchased my camera for the purpose of photographing wildlife, mostly for identification but also to try to capture some unique and emotive shots. But unique and emotive are not always at your control, especially if you've decided to not manipulate your subject. I didn't think it right to capture this creature; it clearly had somewhere to be! So I did the best I could as it crawled towards me, pattered through the garden, and trudged through a miniature forest of grass. This little caterpillar is not afraid of my hand! After it had crawled off into the bushes and I lost sight of it, I ran inside to identify the beast. This can be a very tricky task, requiring your memory, photographs, the internet, field guides, or a biologist with local expertise. Google is my first starting point - not because it is the best, but because I am impatient. Lucky for me, the first (non-advertisement) link Google returned for "caterpillar identification guide Massachusetts" took me to an excellent caterpillar guide on DiscoverLife.org, where I could search for caterpillars that had certain identifiable attributes. Noting that this caterpillar was "yellow/white" in main body color and had "hair pencils" or "lashes" of hair (tight groups of longer setae that look like eyelashes), I cut down the pool of potential species to a few and by looking at pictures quickly identified the beast as a hickory tussock moth caterpillar, or Lophocampa caryae. Using the scientific name like a key for unlocking a wealth of knowledge, I re-searched Google (ah, so that's where "research" comes from?). The species is named after its preferred food - hickory tree leaves - and its hairy groups of setae, or "tussocks." It is also known to feed on walnut and butternut trees, as well as beech and oak. These fascinating creatures complete their life cycle in a single year! 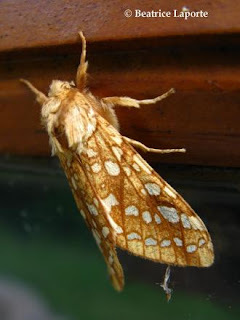 Adult moths take wing, mate, and lay eggs from May to July. 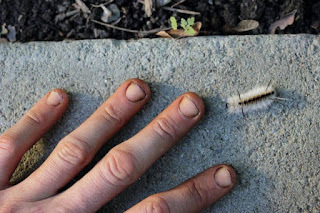 The developing caterpillars are out and about from July to late October, when they start looking for a place to "coccon" overwinter and metamorphose in the spring. And perhaps statistical probability explains why I had the fortune to come across one, for this year appears to be a boom year for this species. Indeed the paradox of nature is that it is in constant fluctuation - wars waged between predators and prey means species may be rare some years or decades but common the next. What a system all the non-human species must still contend with!